Highway 395 parallels the Eastern Sierra mountains, also known as the "range of light", and provides for some of the most amazing photographic opportunities in California. 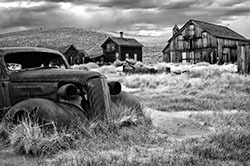 Join us for this two-day workshop in the high desert of Eastern California, visiting exciting locations such as historical Bodie, Mono Lake, and Convict Lake. 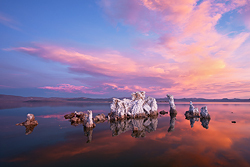 In the morning, we will begin this workshop by photographing the sunrise over the surreal tufa formations of Mono Lake, one of the most recognizable and iconic locations for landscape photography in the Western United States. 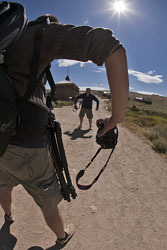 From Mono Lake, we will spend the afternoon photographing the ghost town of Bodie. In the late 1800s, the town of Bodie was a thriving outpost in the search for gold, and its more remote location aided its reputation for lawlessness and mayhem. The early 1900s saw a severe decline in population, and ultimately the town was abandoned. Now, thanks to preservation efforts from the State of California, the town is in a protected state of "arrested decay" and a true photographer's playground. You will have ample time to wander the area and capture a true piece of Americana! The late afternoon will be spent photographing one or two of the many lakes that lay at the foot of the Eastern Sierra, and are a short drive from highway 395. Weather in this section of California is unpredictable and often amazing. It is not uncommon for late afternoon thunderstorms to roll into the area, which creates very dramatic skies. 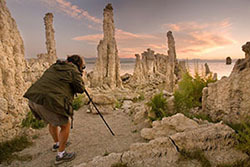 We will return to Mono Lake for an evening shoot. With the height of the Sierra limiting evening light from the west, Mono is the best option for capturing a memorable sunset. It's also the perfect way to draw from all you've learned throughout the workshop, and capture one last set of memorable images. All of our workshops are designed to focus on helping students work on the areas of photography that is most important to them. From camera settings and composition, to the use of filters to properly balance tricky exposures...our first priority is providing students with an opportunity to learn. We want you to go home with knowledge that will benefit you every time you take out your camera. Lodging and meals are not included. Suggested lodging is at the Lake View Lodge or Ellery Lake Campground. PLEASE NOTE: The Lodge books quickly this time of year, and the campground is an alternate option for you.